Israeli checkpoints, concrete walls, and the ongoing blockade of the Gaza strip continue to reinforce the growing opinion of Israel as an apartheid state. Sasha Polakow-Suransky’s book The Unspoken Alliance details Israel’s ties to the original apartheid state — South Africa. 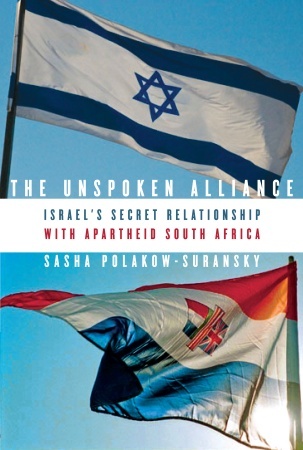 The book describes how “material interests gave birth to an alliance that greatly benefited the Israeli economy and enhanced the security of South Africa’s white minority regime” (p. 11). The background to this cooperation is complex. South Africa’s governing political party, the National Party, primarily represented the Afrikaner people. These were the descendants of Dutch, French, and German Protestants. They were marked by their staunch Calvinism as well as their unique ethnic identity. Despite early opposition to Jewish immigration and some pro-German sympathies during the Second World War, the Afrikaners were not inherently anti-Jewish. The strong Protestant religious feeling that shaped much of Afrikaner identity played a role in their perception of Israel as the “Holy Land.” As Polakow-Suransky notes, “Afrikaner nationalists drew heavily on Jewish history and symbolism” (p. 14). In 1953 South African Prime Minister D. F. Malan would become the first head of government to visit Israel while in office. During the 1967 Six-Day War the South Africans cheered the Israeli success as a David-and-Goliath victory against Soviet-backed regimes. Despite this, the feeling between these two countries was not mutual. Most Jews found South African “white supremacy” inherently distasteful. And so in 1961 when the South African Foreign Minister defended apartheid in front of the U.N., Israel was one of only two “Western” states to support his censure. Months later the Israelis again supported an initiative for diplomatic sanctions against South Africa while the United States, Great Britain, and other Western nations remained opposed. South Africa retaliated in 1963 by pressuring its own Jewish community, going so far as to the ban the transfer of gift funds to Israel. (South African Jews had, until this point, been one of the highest sources of per captia donations to Israel in the world.) The South African government considered severing relations with Israel but held back due to fear of foreign repercussions. The Israelis eventually recalled their own ambassador in September of that year (p. 38). How then did South Africa and Israel eventually form an “alliance”? The Six-Day War and the resulting conflicts polarized world opinion of Israel. France, which had hitherto been a source of “intense, if secretive, military cooperation,” began to cool relations with Israel (p. 36). Likewise, many of the relationships that Israel had cultivated with African and other third-world states simply disintegrated. Of the 32 Israeli technical and trade missions in Africa, only 4 remained following the Yom Kippur War. Likewise, the conflict had left the Israeli economy “in shambles” according to Polakow-Suransky (p. 76). The Israeli solution was to build a massive arms export industry. Like Israel, South Africa was facing an increasingly polarized world opinion. Its stability was undermined both by internal disturbances and the destabilization of neighboring regimes. Politically its options were limited, but economically it still possessed significant assets. For example, South Africa possessed 86% of the total world reserves of platinum group metals. It also possessed 83% of the world’s reserves of chrome ore, 49% of gold reserves, and 17% of uranium reserves. South Africa faced a security threat. Israel faced an economic threat. The solution for both was to develop extensive yet highly secretive military cooperation. Between 1973 and 1981 the Israeli arms export industry increased from $70 million to nearly $1 billion (p. 77). By 1979 South Africa had become Israel’s largest arms client, accounting for 35% of their military exports (p. 132). These deals included tank engines, aircraft, and nuclear technology. Yet the Israelis, like most Jews, generally condemned South African apartheid. In judging their relationship with South Africa the Israelis seemed to be asking the old question, “Is it good for the Jews?” Perhaps the best answer was articulated by an Auschwitz survivor: “We will make agreements with the devil to save Jews from persecution and to secure the future of this state” (p. 91). But such agreements require a certain amount of discretion. Because, you know, not everyone approves of making deals with the devil. As one Israeli editor advised a South African, “You are faced with a hypocritical world. . . . The trend is to sound liberal. To be liberal is to be nice. . . . But make the world believe you are sincere. You have to be hypocritical to survive” (p. 162). Indeed, during the 1970s South Africa had launched an effort to improve its world image. This effort imploded when the campaign, which had been using secret funds, was exposed by South African newspapers. As world opinion turned irrevocably against South Africa its former Israeli “allies” became eager to distance themselves from the apartheid state. In 1986 the United States passed the Comprehensive Anti-Apartheid Act. The Israelis, afraid of losing American aid, promptly issued their own sanctions and vowed to cut off any new deals. By the late 1980s the secret “alliance” was nearing an end. The details of this relationship are interesting but Polakow-Suransky saves the book’s most important insight for last. In the epilogue he expresses concern that, due to the “demographic threat” of a growing Palestinian population, Israel will have the choice of being either a democratic state or a Jewish one, but not both (p. 240). That is, Israel will have to embrace apartheid-like policies or enact a “two-state solution.” In either case Polakow-Suransky has grasped the problem with multiethnic states: they usually don’t last. Published: August 8, 2011 | This entry was posted in North American New Right and tagged book reviews, Israel, North American New Right, originals, Sam Davidson, South Africa. Both comments and trackbacks are currently closed. So the inevitable Jewish Dolchstoss came as early as 1986! South Africa/Israel would be the one single alliance between White tribalists and Jewish tribalists one could possibly point to as a precedent for a WN/Jewish conservative alliance now. And look how that worked out! So, which one’s the devil? This is thoughtful and well-researched.